Home / Our Work / Karbach Brewing Co.
Karbach Brewing is a two-story, 22,040 SF brewery and tap house. With a full kitchen, two event spaces, a restaurant and bar with indoor and outdoor seating, this versatile and functional space features a state-of-the-art brewhouse and fermentation system, as well as a restaurant and tap room that are making a reputation in their own right. This facility utilized three different construction types to suit the operational needs of each part of the brewery including poured in place concrete, pre-engineered metal building, and traditional steel construction. 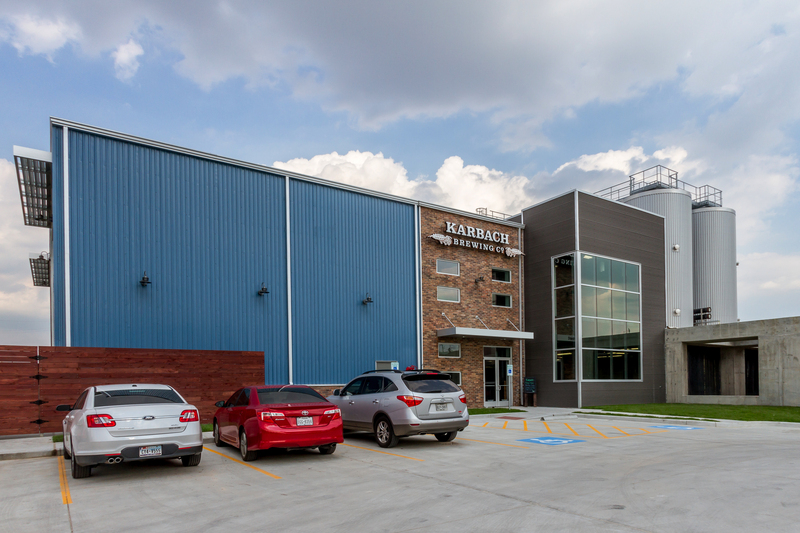 Karbach’s exterior and interior finishes played to its small town roots, utilizing a combination of brick, reclaimed wood, and sheets of rusted tin, while the rest of the facility revealed its high tech side. The brew house, which is primarily controlled through automated control systems, is clad with curtain wall glass and horizontally mounted metal panel, a testament to the simplicity of modern design. The three foot thick concrete beams serve as the support structure for the fermentation vessels and the first concrete beer bunker in Houston.